With easy access to literally thousands of routes on hard, high-quality sandstone—not to mention soaring red cliffs, out-of-this-world rock formations, and enough variety to keep all levels of climbers engaged, Moab is a must-visit destination on your climbing bucket list. 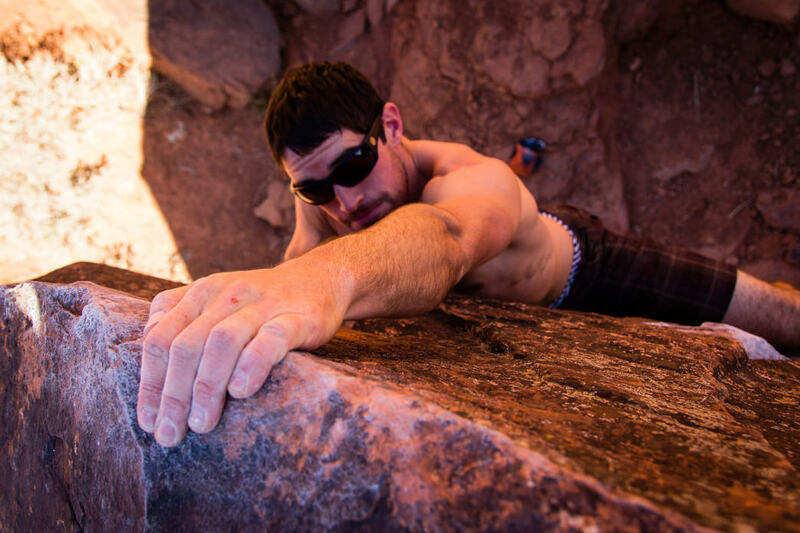 Several of the best-loved climbing areas in the West are just a stone’s throw from downtown Moab. 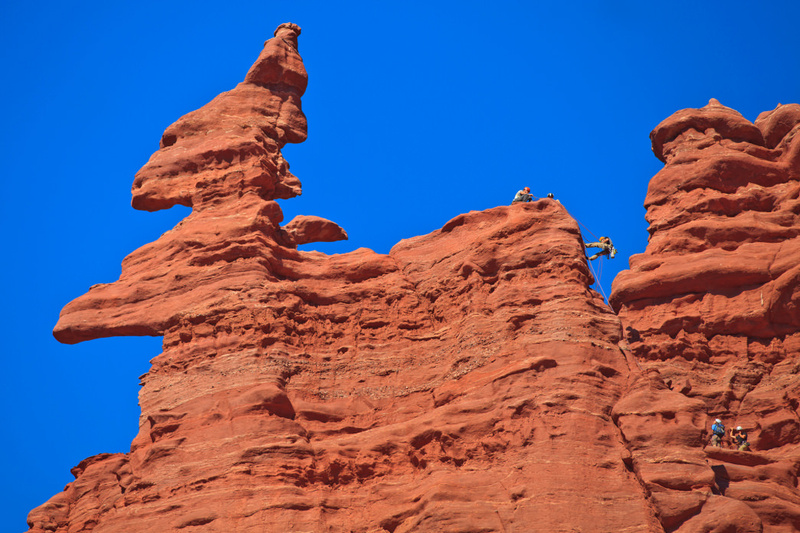 Whether your specialty is splitter cracks, clipping bolts, or desert towers, there’s something in the Moab area for you. 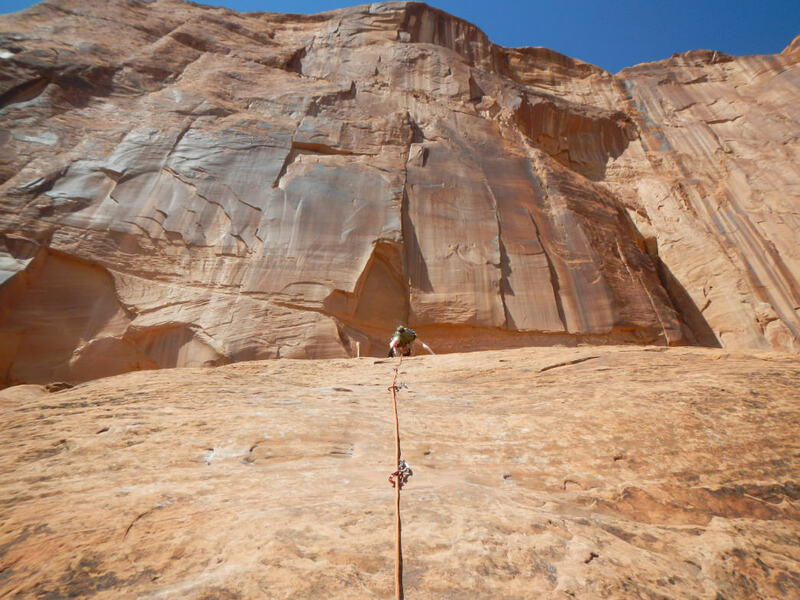 Head to Potash Road for a perfect intro to Moab-area climbing. 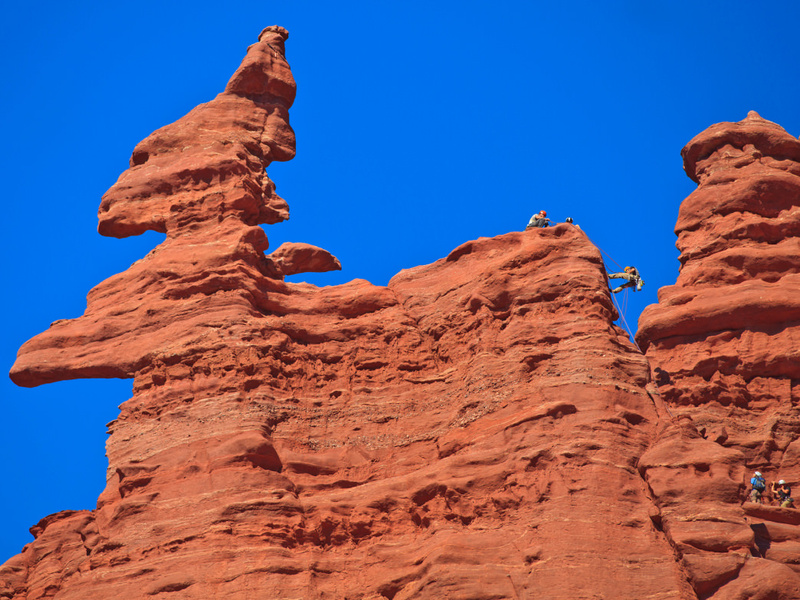 The towering 500-foot Navajo sandstone cliffs certainly look intimidating, but routes along the road are mostly single-pitch. The Wall Street crag is a particularly good place to get a feel for desert climbing—it’s got a high concentration of moderate routes (a few under 5.8, and plenty of 5.9 to 5.11) in the area. Like most climbing areas near Moab, you’ll find lots of trad up Potash, but there’s a healthy serving of slabby sport routes, too. Climbs here are literally right on the road, and they bake in the afternoon sunlight, so arrive early to beat the heat (and the crowds; guided parties often head to Potash). How to get there : From town, head north on US-191 towards Arches and take a left on UT-279, which parallels the Colorado River. Venture a little farther from town to this hunk of Wingate sandstone, where you’ll find plenty more moderates rated 5.10 or easier and a mix of trad and sport routes (again, if you’re clipping bolts, expect to be climbing sticky slabs). Ice Cream Parlor is a great spot to work on your crack-climbing technique, and like many Moab-area crags, the single-pitch trad routes here have bolted anchors. The crag faces west, so during the warmer months, it’s best climbed in the morning, when it’s still shady. Bonus: Hunter Canyon, right across the road, has great (and cool) walk-up campsites. How to get there : From Main Street in Moab, head west on Kane Creek Boulevard (the turn is right next to the McDonald’s). Follow this along the river until the pavement ends; from here, it’s just over 3.5 miles to Ice Cream Parlor. 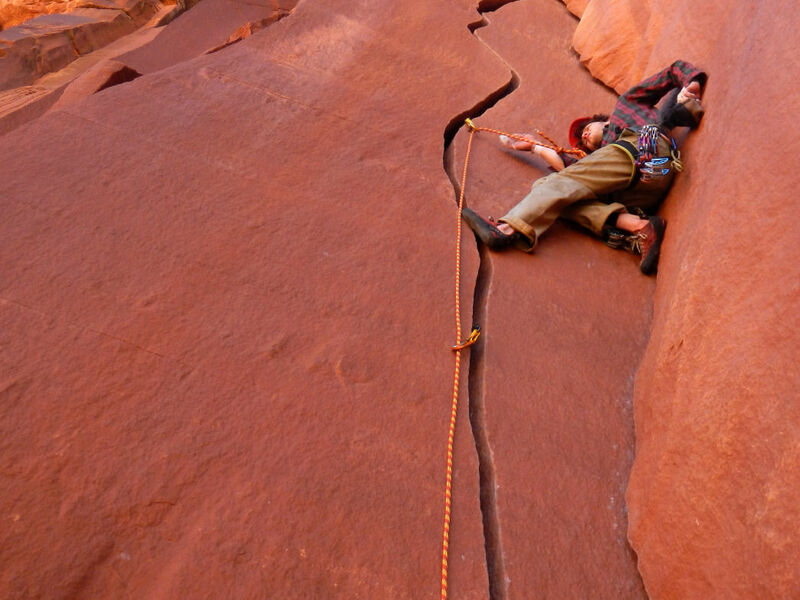 It should come as no surprise that Arches, arguably Utah’s most famous national park, is chock-full of excellent, adventure-style climbing. The soft Entrada sandstone, formed during the Jurassic Period, creates a huge variety of otherworldly shapes with equally far-out names: hoodoos, for example. Owl Rock (one pitch, 5.8, 100 feet) and nearby Bullwinkle (one pitch, 5.6, 95 feet) are both great beginner tower climbs. There are also several routes on the iconic Three Gossips formation and on Elephant Butte, the tallest point in Arches. Before you go, familiarize yourself with climbing regulations in the park, including that named arches cannot be climbed, and no white chalk is allowed—use special earth-toned chalk or, better yet, go without. How to get there : Head north from town on US-191. The Arches entrance is five miles north of town on your right. Entrance fee is $25 per vehicle and good for seven days. Arches’ 24-mile-long paved road provides easy access to climbs in the park. These ethereal Cutler sandstone formations look like the muddy sand castles you made at the beach as a kid, but the Fisher Towers are at least slightly more solid than they look. 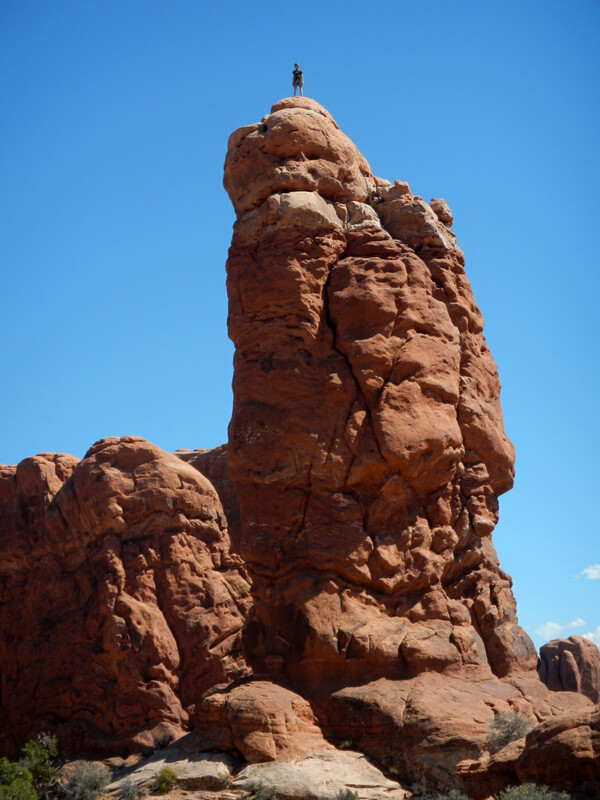 The tallest tower around is the 900-foot Titan, but it’s not as well-known as its neighbor, Ancient Art, whose distinctive corkscrew summit is one of the best (and, for good reason, most popular) climbs in the Moab area. From the towers, you’ll also catch phenomenal views of Castle Valley, including monolithic Castleton Tower and the recognizable Priest and the Rectory formations, plus the snow-capped La Sal Mountains. There’s excellent BLM camping ($15 per night for most sites) at several nearby campgrounds, including Onion Creek. How to get there : From Moab, head north on 191 and take a right on Scenic Byway 128, which parallels the Colorado River. Head east for 23 miles to the Fisher Towers turnoff. When you’re ready to put your crack climbing game to the test, head to Indian Creek, one of the most beloved climbing areas in the American West. This is a trad climber’s paradise, with hundreds of routes on clean, quality cracks in Wingate sandstone. Routes are mostly 5.10 and above, so make sure you’re prepared, both in terms of gear and a good lead head on your shoulders. Doubles won’t cut it at the Creek; we’re talking quadruples (or more!) for lots of cracks. It’s tough to narrow down the best crags at Indian Creek, but Supercrack Buttress is home to some of the best climbs in the desert. If you’re still in tower mode, head to South Sixshooter, which has a variety of moderate routes. Camp only in designated BLM campgrounds at Indian Creek. How to get there : Head south on 191 from Moab, then west on State Highway 211 (look for a sign for the Needles District of Canyonlands National Park). Follow the road into Indian Creek, and, if you have time, make a stop to see petroglyphs at Newspaper Rock. Ready for an active rest day, or looking for some desert climbing without the exposure? With nearly 80 problems ranging from V0 to V11, the boulders near Big Bend on the Colorado River provide hours of entertainment for climbers of all stripes. (That said, the ratings were established by burly locals and are fairly stout, so don’t be discouraged.) Most problems are of a moderate height, so you won’t need a huge collection of crash pads. If you’re looking to join the social scene before you retire to your tent for the night, this is it. There’s excellent camping right across the street at Big Bend ($15 per night), which sits on the Colorado River, plus several other campgrounds just a few miles up or downriver. How to get there : From Moab, head north on 191 to Scenic Byway 128. Keep an eye out for the Big Bend Campground; the obvious boulders and parking area are on the other side of the road. When you’ve worked up an appetite and are done climbing for the day, you’ve got some options in town. Milt’s Stop & Eat, just east of Main Street, is beloved for its burgers and shakes. If you’re looking for local beers, head to the Moab Brewery, where, unlike at Utah’s state-run liquor stores, you can purchase cold beer to go in addition to what’s on draft. Whatever you do, kick off the next morning with a serious breakfast burrito at the Love Muffin Cafe.